If you’re looking for a satisfying, in-demand career where you can make a difference, nursing may be the right option for you. More hospitals and employers are requiring nurses to hold a BSN degree to practice in their facilities, so attending one of the best BSN programs in New York will give you the advantage and skills you need in your career. There are many accredited BSN programs in New York to choose from that are offered by excellent schools. A good BSN program will incorporate community health, research, clinical experience, leadership, health promotion and managerial skills. Nurses with a BSN usually work in community settings and hold leadership roles within their employment, due to their education and training. Be sure to look at the New York Board of Nursing requirements for a nursing license and make sure that program meets all of the requirements. If a program achieves less than a 75% pass rate on the licensing exam, the school could risk losing its accreditation. Make sure the school is accredited so you don’t waste any time or money. BSN programs in New York have requirements in order to apply, so you’ll want to be sure to research the requirements and have them prepared. Some requirements vary, but below is an example of what most schools require for their BSN program. The following schools have some of the best BSN programs in New York has to offer based on pass rate, acceptance rate, and cost. Adelphi University currently enrolls over 7,000 students with a 10:1 student-to-faculty ratio. Adelphi offers a BSN program, as well as an accelerated BSN program and an RN to BSN program. Students who graduate from these programs learn concepts relating to the promotion of health, care during illness and long-term care, which allow them to find careers in a competitive field. New York University offers one of the best BSN programs in New York and in the nation, and for good reason. Students will be prepared to pass the NCEX, receive clinical education from the most prestigious medical centers in the world, and will be taught by nationally recognized faculty. Students who graduate are qualified to be a generalist nurse by the AACN. Although the University of Rochester doesn’t offer a traditional BSN program, there are several ways a student can get a bachelor’s of nursing degree. Rochester offers a 3+1 program where students can take three years at Rochester Community College then take their last year at the school of nursing. They also offer a dual degree which allows students to combine their interesting in nursing with a specific academic discipline that allows them to acquire a BSN in four-and-a-half years. Rochester also offers an accelerated program for students who already have a bachelor degree that allows them to become a nurse in 12 months. Molloy College opened its doors in 1955 and is now Money Magazine’s #1 “Value All-Star” in the nation. Molloy offers students an excellent and personal experience with a 10:1 student-to-faculty ratio and a high chance for financial aid. Molloy’s BSN program is a total of 128 credits. Students must have a GPA of at least 2.5 and can only pass courses with a C+ or higher. Binghamton University has multiple nursing programs for all kinds of students. They have accelerated programs, dual programs, transfer programs, and the traditional four-year BSN program. The degree requires 126 credits and students wishing to enter must show strength in chemistry, biology, and mathematics. 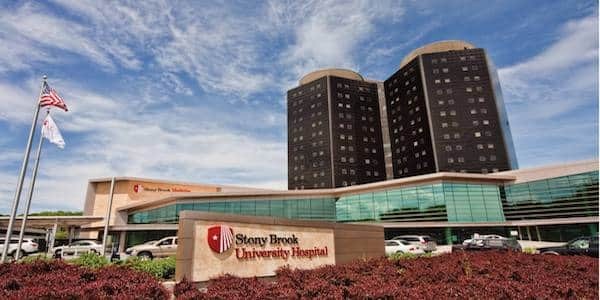 Stony Brook University has a basic and an accelerated BSN program. The traditional program requires students to complete two years of general education studies before studying patient-centered nursing practices. Both programs prepare students for the NCLEX exam. St. John Fisher College‘s nursing program is grounded in evidence-based practice and discipline knowledge. Students will have the chance to study in Wegman’s School of Nursing simulation center, which mirrors an actual hospital setting. Students who graduate the program are prepared for an entry-level general nursing role and are often recruited in places where they were they studied in student placement clinical practices. Wagner University has one of the best BSN programs in New York designed to prepare students to promote, maintain, and restore the health of the community. Students will study the stressors that affect health, expand their knowledge of the medical field, and develop leadership roles as professional nurses. Pace University has been educating professionals since 1906, and their nursing program is no exception. Their BSN program provides skills and techniques from the get-go. Students are given state-of-the-art training from respected instructors. They will be given opportunities to utilize and practice their skills live with video reviews for self-evaluation. D’Youville is a private college with about 3,000 students. For over 70 years, the BSN program has been teaching students interpersonal and communication skills, critical and creative thinking, and problem-solving. If you’re interested in becoming a nursing professional, D’Youville is a great place to start. The University at Buffalo has a rigorous nursing program comprising of a robust curriculum, clinical nursing, and general education. Buffalo is dedicated to making sure students have the professional training and skills necessary to succeed in the work field. Concordia College has been educating students since 1881 with a Lutheran heritage and faith-based learning environment. Their BSN program will provide you with all the tools needed to keep up in the fast-paced healthcare environment. With small classes and hands-on practice, Concordia College produces some of the best nurses in the state. Elmira College is a private college founded in 1855. In the nursing program, students go through extensive in state-of-the-art facilities. After completing general studies, students will learn enhanced concepts and will experience in-depth concentrated hospital experience. Hartwick College offers students an unparalleled learning environment and is committed to making education accessible and affordable. Its nursing program is challenging and thorough, and students will receive hands-on training in clinical practice. The BSN may be completed in the traditional four-year program or a three-year program. CUNY Hunter College was founded in 1870 and is located in the heart of Manhattan. The BSN offers a humanistic and comprehensive study in health care. Students who graduate the program are eligible for the NCLEX and are prepared for graduate studies in a master’s degree. The College of Mount Saint Vincent has over 1,800 students and a student-to-faculty ratio of 13:1. To get into the nursing program students must have the recommendation of their advisor and have at least a 3.0 GPA. Farmingdale State College is recognized as a center of applied learning and excellence in teaching. The BSN program is made up of 125 credits and must maintain a C+ or higher to remain in the college. Free tutoring and information sessions are provided weekly. Long Island University was founded in 1926 and has empowered students ever since. Their BSN program is offered part time, full time, or as an accelerated 2nd degree. Students will learn the basic nursing science and become a health care provider. Utica College was founded in 1946 as a private, comprehensive college. Their BSN program is perfect for students who are empathetic, calm, and not overwhelmed by the fast-paced healthcare environments. The college will provide students with a liberal education to become a primary, healthcare provider. Roberts Wesleyan College is a Christian college with an education worth the investment. Their nursing program trains students to view patients as holistic beings with bio-psycho-social-spiritual components. They will have a variety of observation opportunities and clinical experience. SUNY Polytechnic Institute offers one of the best BSN programs in New York in a hybrid format with courses offered in the classroom or online. The program provides comprehensive health assessments, nursing research, and evidence-based practice in leadership and healthcare. Le Moyne College is a private Jesuit college and provides nearly 100% of their students with financial assistance. The nursing program focuses on caring for the whole person and will teach students the values, concepts, and perceptions of clients to become a better leader in the healthcare field. Nazareth College was founded in 1924 and is located in near Rochester. Students in the BSN program will receive personal attention and gain experience in a clinical, ambulatory, and community-based setting. Students will be taught problem-solving and data analysis skills to help them become some of the best nurses in the healthcare field. Niagara University is a private university with a Catholic tradition founded in 1856. Their nursing program integrates students into a professional nursing paradigm. The program is designed to educate students to lead, manage, and deliver customer care in a hospital setting. Touro College offers some of the best possible education with top-notch programs. Their BSN program is 125 credits and gives core healthcare sciences and curriculum. Students graduate with excellent performance and most students gain positions immediately after graduation. Daemen College is a private, comprehensive college that teaches students to creatively problem solve and think critically. Daemen offers a 1+2+1 program and provides students with evidence-based practice and leadership skills. This program allows students to enjoy a 4-year college experience while acquiring both an associate and bachelor degree. The College at Brockport was established in 1835 and has over 750 instructional faculty members. Their BSN program will prepare students to care for families, difficult patients, and communities in both a disciplinary and clinical environment. SUNY Plattsburgh is a four-year, public university that is accredited by the American Association of Colleges of Nursing. Nursing students work with dedicated faculty and industry leaders in a highly respected and competitive 120-credit BSN program. SUNY Plattsburgh provides outstanding resources and experiences, including a state-of-the-art simulation center with high-fidelity mannequins, integrated electronic medical record (EMR), and online access to classroom resources. Mount Saint Mary College is a private, four-year liberal arts college. Its prestigious Nursing program is accredited by the Commission on Collegiate Nursing Education. Mount Nursing students enjoy state-of-the-art simulation labs and clinical relationships with more than 40 area hospitals. The Mount’s passionate faculty are dedicated to the success of their undergraduate and graduate students. To be admitted, students must have a 2.75 GPA. The accelerated program offers six start dates each year. Nyack College is a Christian college, seminary, and graduate school. Nyack’s nursing program offers small and intimate classes with a student-centered perspective. Students will receive a practical application and real work experience and discover how to take Christian perspectives into the healthcare industry. St. Joseph’s College was founded in 1916 and now enrolls 1,200 students. The college’s nursing program develops and supports a leader-centered environment and reflective practice. It integrates nursing knowledge, related sciences, and humanities to create life-long learners and professional nurses. Dominican College of Blauvelt is a military-friendly school founded in 1952. Admission requires a 2.7 GPA in the natural sciences and at least 70% in basic skills on the TEAS exam. Classes meet five times a week to adequately prepare students to make an impact as nurses in the world of healthcare. The New York Institute of Technology is a highly-ranked, not-for-profit university. They have one of the best BSN programs in New York that will prepare students for success in hospitals, private practices, schools, and more. Students will receive clinical learning opportunities in multiple care settings. 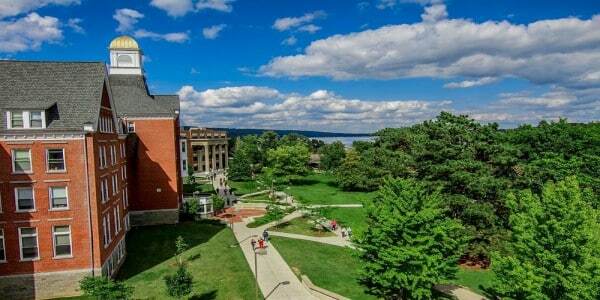 Keuka College has been around for 125 years and seeks to create leaders and exceptional citizens. Their BSN program is unique in that it is a dual program, meaning you’ll earn degrees from Keuka College (B.S.) and Finger Lakes Health College of Nursing (A.A.S.). And you’ll be an RN by the end of your junior year. Alfred State University has received numerous awards and rankings over the years, so it’s no surprise to see it here. Their nursing program serves as an academic foundation for advanced nursing studies that will increase students knowledge and skillset. Flexible learning style choices and clinical practices are provided to students. SUNY Delhi was established in 1913 and is now home to 3,500+ students. Delhi offers a dual degree in nursing, which allows you to gain two degrees in four years, an A.A.S and a B.S. Students will work with credentialed instructors in state-of-the-art facilities as well as be prepared to take the NCLEX exam at graduation. Monroe College was founded in 1933 and offers a fully accredited BSN degree. Students who have completed their generals participate in rigorous nursing education with an excellent curriculum that integrates evidence-based practice and research. This degree will teach students concepts from health administration, public health, and a variety of electives. Schools on this list were ranked mostly by NCLEX-RN pass rates, with other quality-indicating factors such as tuition and acceptance rate slightly affecting the rankings to push the higher-quality schools toward the top. See our methodology page for more detail.